Sunreef Yachts is delighted to announce that the first unit of the ready-to-sail yacht, Sunreef 60 LOFT was launched in October 2013. This luxury ‘pret-a-porter’ yacht concept is based on the company’s 10 years’ experience, extensive knowledge and understanding of the owners’ needs and contains all the essential options and equipment for comfortable sailing and living on board. GRACE can comfortably accommodate 6 guests in 3 spacious cabins located in the hulls and 2 crew in the port aft cabin. Fully equipped open galley with both Siemens and Gorenje appliances located in the portside hull connects directly with the saloon located on the main deck via transparent glass wall turning into opaque with only one button push. The cockpit and the saloon are both located on the same level and connected with a large sliding door which enhances the impression of one, seamless space. The combination of light-colored upholstery with floor made of light rustic oak and Canaletto walnut furniture with black high-gloss panels makes the interior very elegant. The yacht’s technological features include a carbon mast with canoe boom both in-house made, square top main sail and folding propellers, the best available on the market. 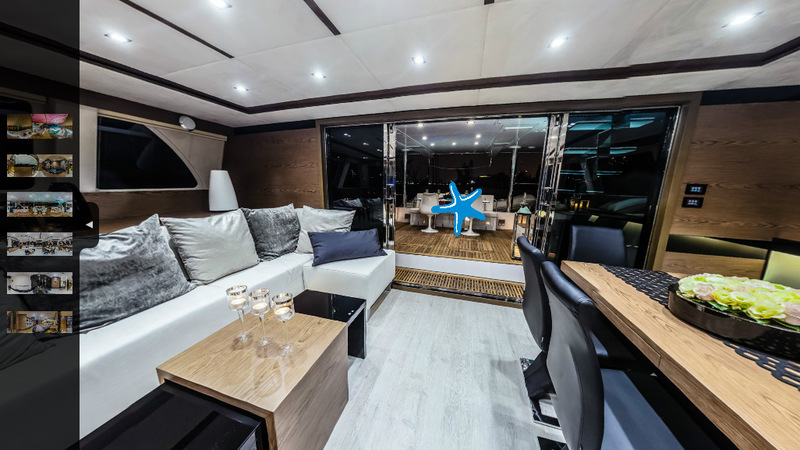 Additionally, there is a lot of innovative illumination on the yacht, including LED lit stairs to the flybridge, illuminated cockpit and flybridge tables, all made from 3form panels as well as 4 underwater OceanLED lights. GRACE is also extremely easy to handle even for one crew member thanks to the sailing gear smartly placed within hands reach of the flybridge with electric winches, two Yanmar 110 HP engines and original davits system to launch the dinghy from the aft platform. Her expected speeds should reach 12 -15 knots on sails. As a ready-to-go vessel, all electrical, plumbing, hydraulic systems and Williams tender are also included within the fixed price.